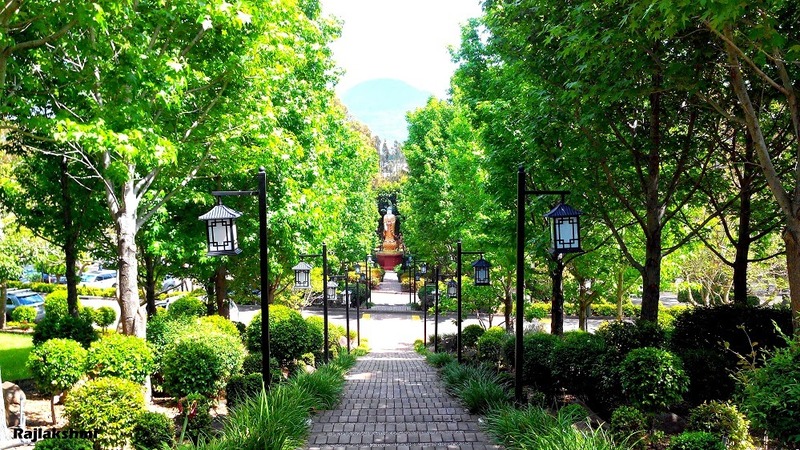 Looking for a peaceful weekend getaway from Sydney? 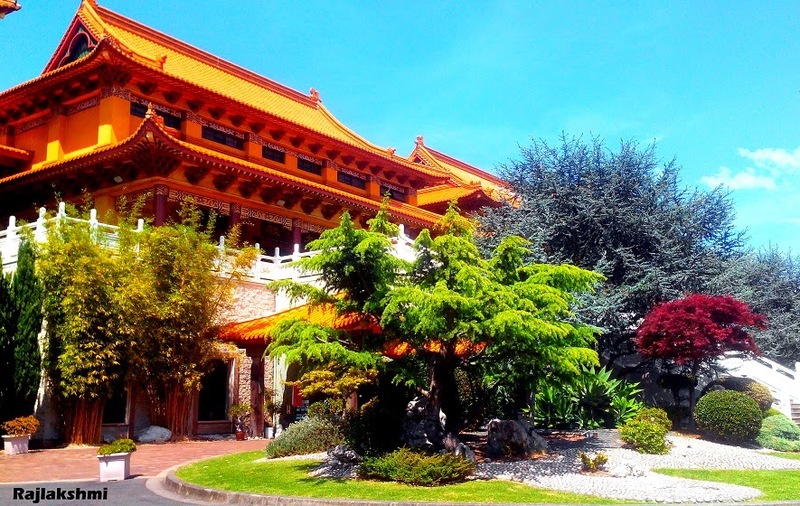 Drive for about an hour towards Wollongong and you will find a serene abode of beauty and Tangerine Pagodas rising to the sky. 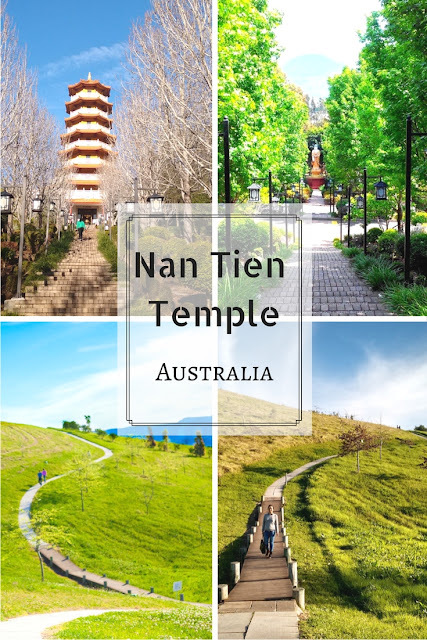 Nan Tien Temple, also called Southern Paradise is the largest Buddhist temple in Southern Hemisphere. It was constructed in 1992, using traditional techniques and materials used by Chinese craftsmen. 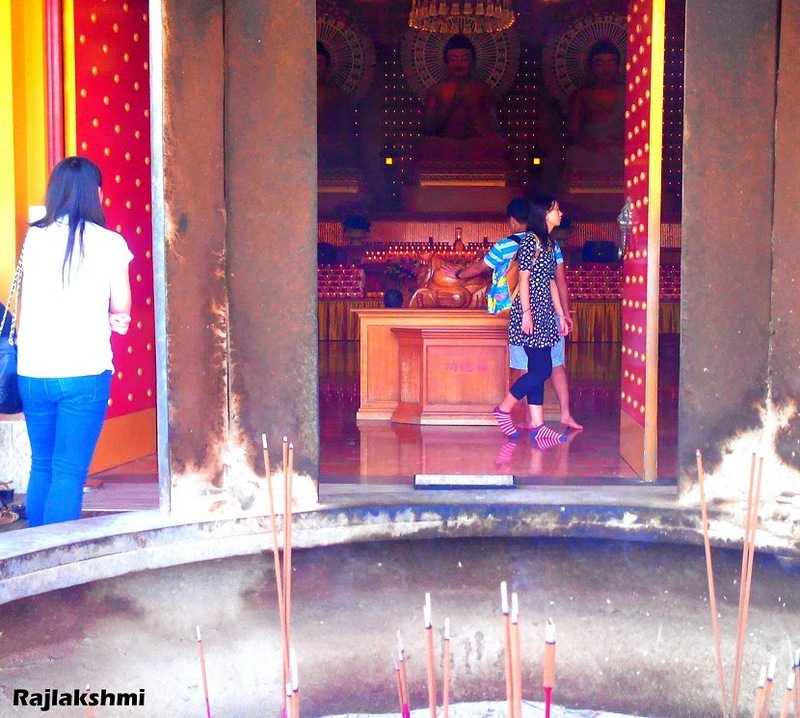 There are two temples where visitors can light incense sticks, pray and meditate. I was totally amazed by the exquisite beauty of the interiors. From top to bottom, the four walls are covered with rows of miniature statues of Buddha, while a gorgeous chandelier hangs down from the ceiling. 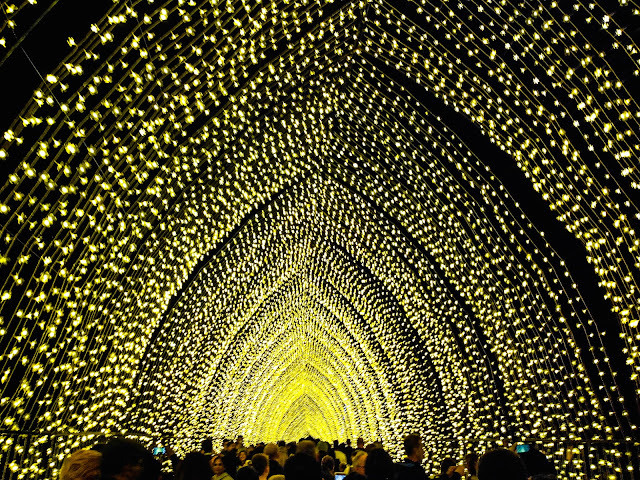 The golden glow of the decor immediately lightens up your eyes. 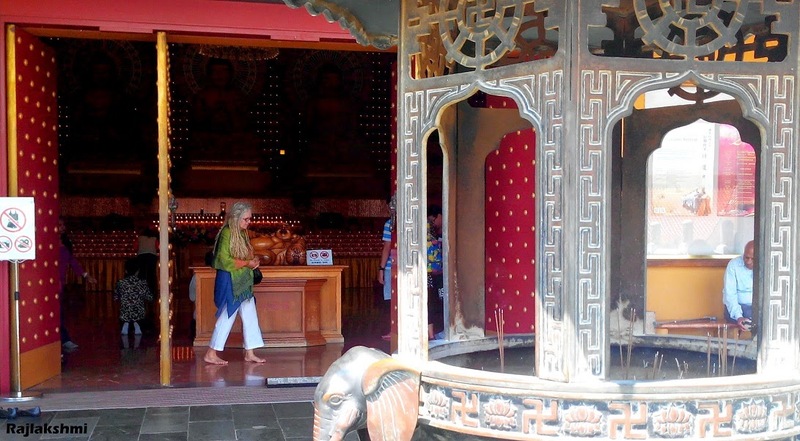 Huge Buddha statues are installed in both the temples. Since photography wasn't allowed inside, I couldn't capture the interiors. However, I have a look at the gorgeous courtyard. 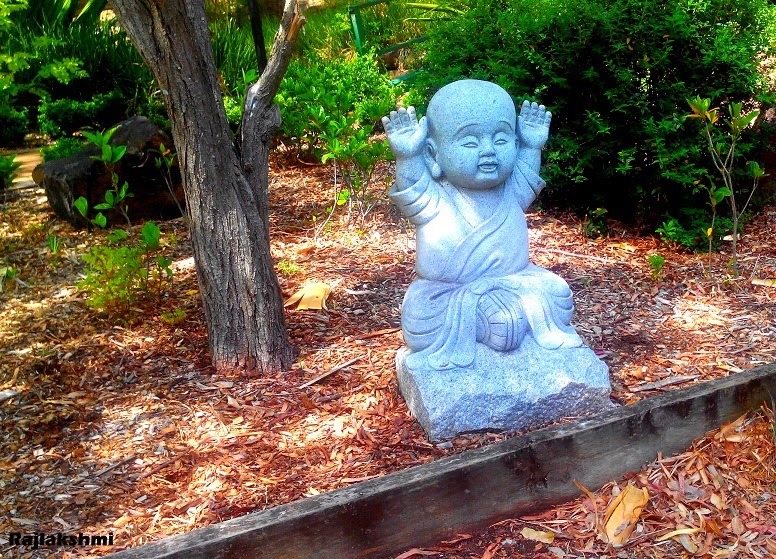 These adorable little monk statues are placed across the garden. I just can't get over their cuteness. The color scheme of the buildings are so bright and joyful that they instantly make you feel lively. 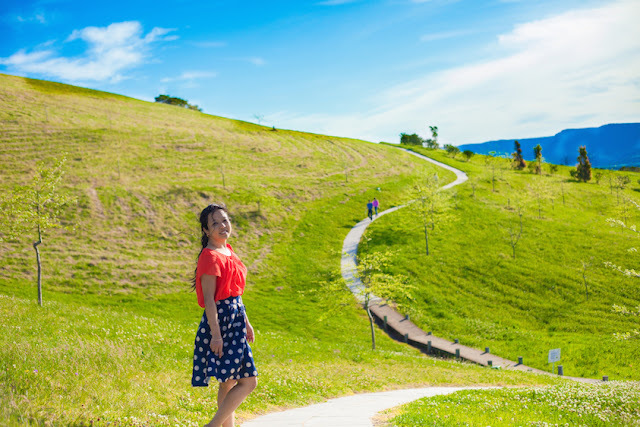 I loved watching this riot of colors, orange against the cerulean sky, surrounded by various shades of green plantations. 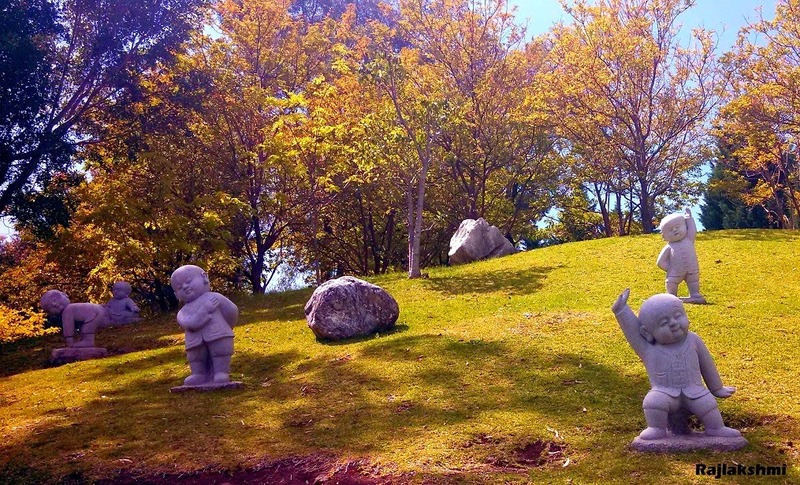 Wiki - The architecture of the complex is notable because it incorporates the features of several styles of Buddhism. 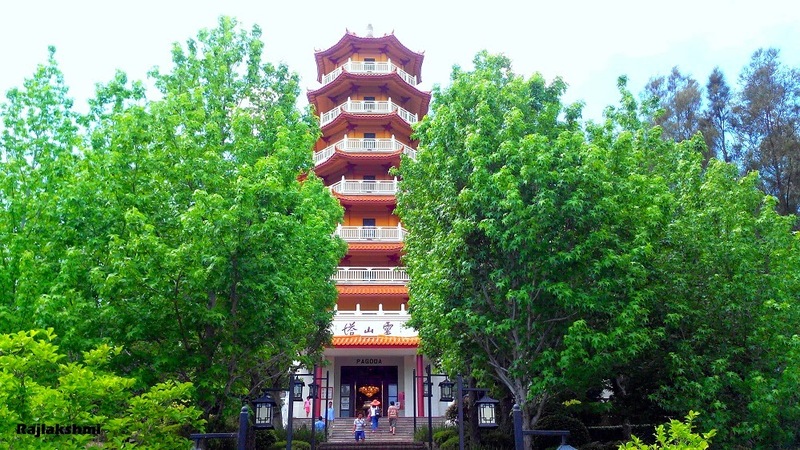 The pagoda is distinctly Chinese, with flying eaves and an angular profile. The main temples incorporates features of Tibetan monastic architecture, with multi-storey painted temple buildings set atop high stone platforms (see the Potala Palace). 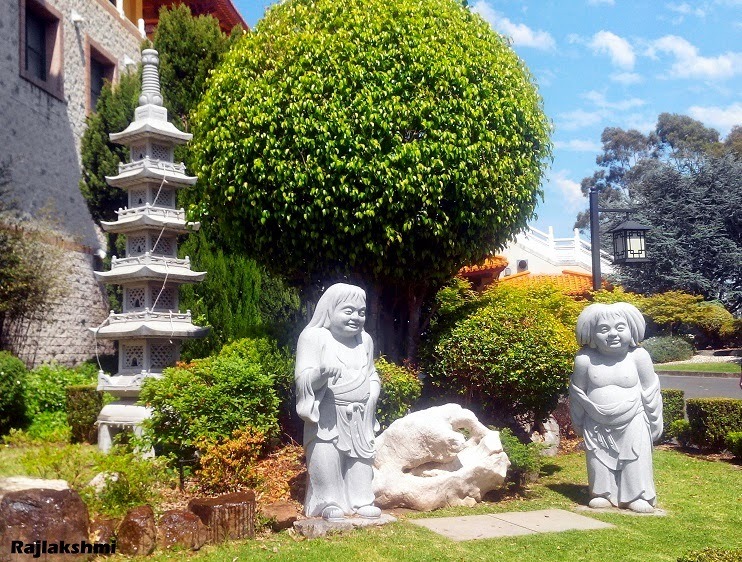 The courtyards feature Japanese-style gardens, while the statues and shrines often incorporate bright, South-East Asian colour schemes, in contrast to the more austere styles favoured in China. 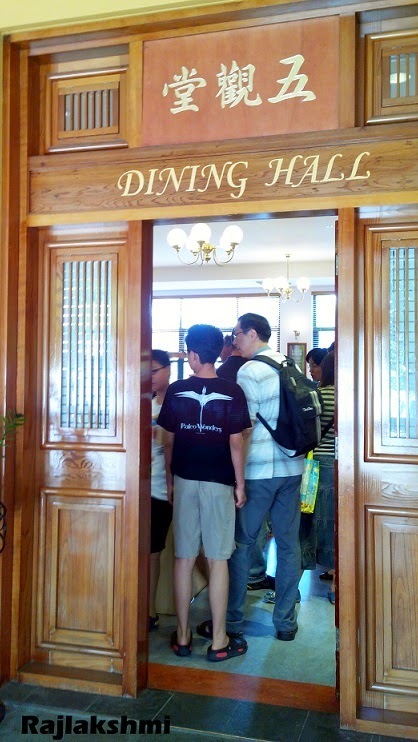 Around the courtyard, you will find a souvenir shop, seating area, visitor room, toilets and Dining hall. 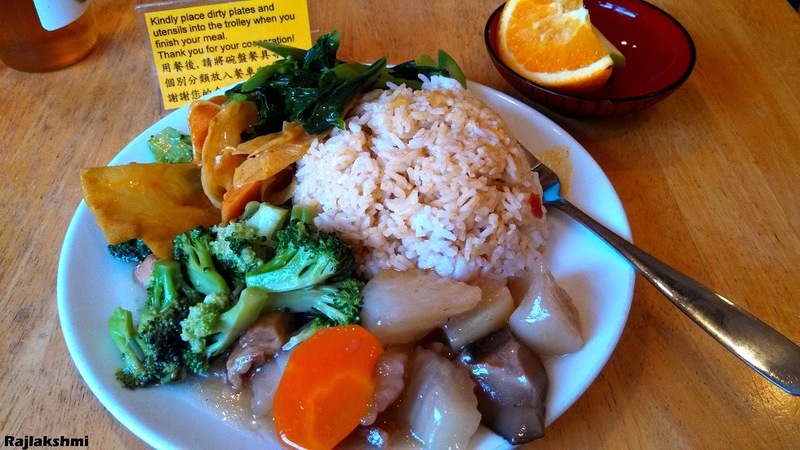 We were right on time to enjoy a delicious lunch of rice/noodles and four different vegetable curries. My favourite were the mushroom and broccoli dish. Along with food they served two slices of fruits too. The foodie in me was absolutely happy!! 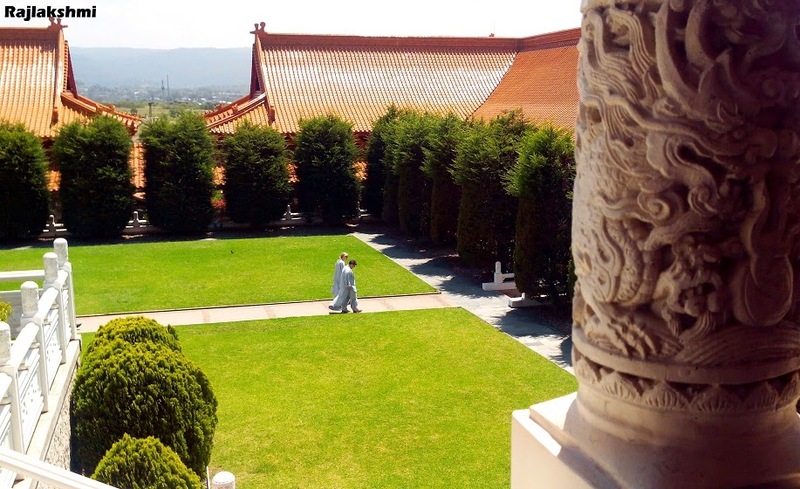 Dressing - No shorts/hot pants, tank tops or singlets allowed inside the temple/prayer room. 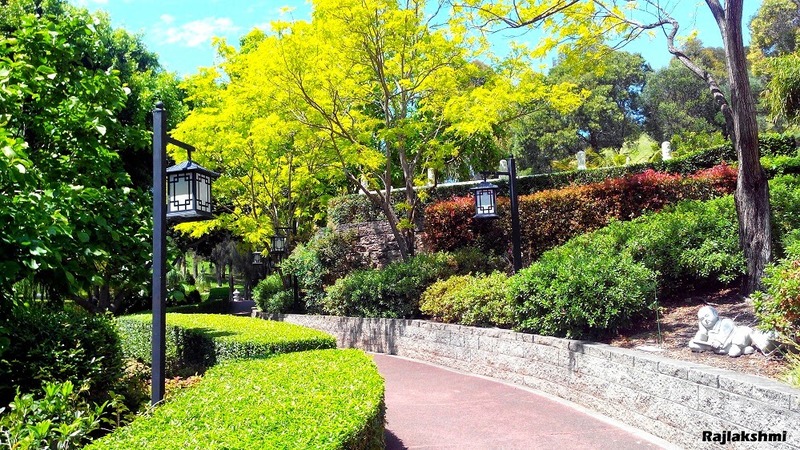 Though you can roam around courtyard and the garden. 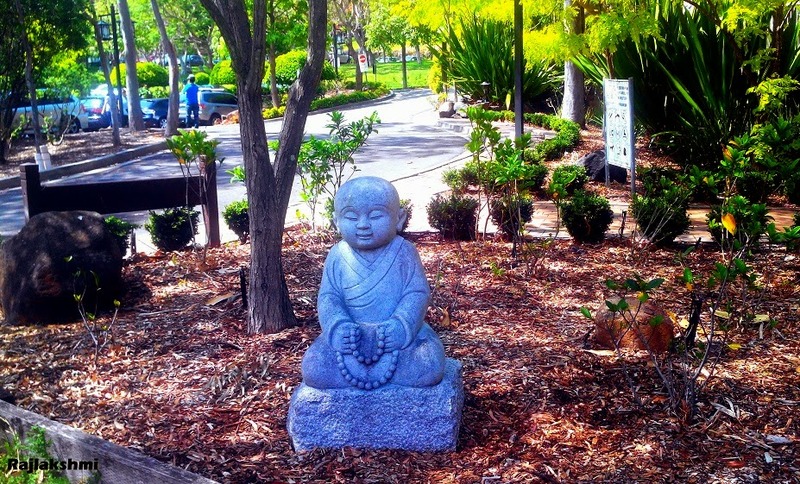 Those Monk statues are adorable. I used to think you're good with the blues but I love your greens, reds and yellows too. The colours are amazing. Lovely pics. What a beautiful place! Thank you for sharing your experience! This place lokks heavenly! Lovely pics too, Rajlakshmi!